Phoenix Copier Rental has what you need to propel your business to a new level. Whether you are establishing a new location for your company or expanding to additional locations, your needs for copy machines and office equipment could be rapidly changing. Let our experienced sales and marketing staff assist you with making the right choice for your organization. 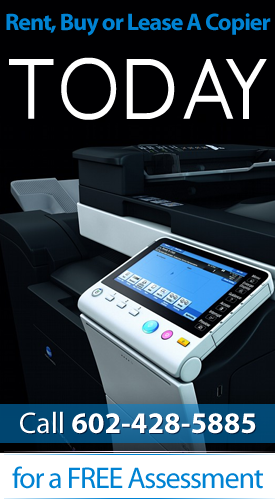 Phoenix Copier Rental is your one-stop-shop for small businesses in Phoenix. Whether you have a small commercial operation, an entire school district, or a one-person home-based business, we can help you find the right copier to rent. Don’t worry if you don’t have enough capital on hand – we can help you establish copier equipment to keep doing business. Highlight key features on work plans, edit documents or mark-up hard copies of documents and fax or email them quickly to others working on the project team. Copier rentals in Phoenix are easy to find, but make sure you’re producing quality documents and finished products with quality equipment. Make sure to contact Arizona Copiers today for the best prices and service. If you are trying to find an established copier company, we have the expertise and knowledge your business needs to succeed.Is your budget limited? Learn how to mark-up and edit documents with ease, send drafts quickly to colleagues and clients and get connected. Let Phoenix Copier Rental help you decide which model copier is right for your small business. Copier rentals in Phoenix can help you if you don’t have enough capital on hand – grow your business with our affordable financing options. Don’t sacrifice high resolution when converting documents to PDF and emailing them to clients. Whether you are establishing a new location for your company or expanding to additional locations, your needs for copy machines and office equipment could be rapidly changing.